This is the second post in a series about how to tune your drums. Check out the first post where I teach you how to tune your toms by clicking here. Here is a quick video on how to tune your snare drum! In this video I’m using an Evans Genera HD Drum Head . 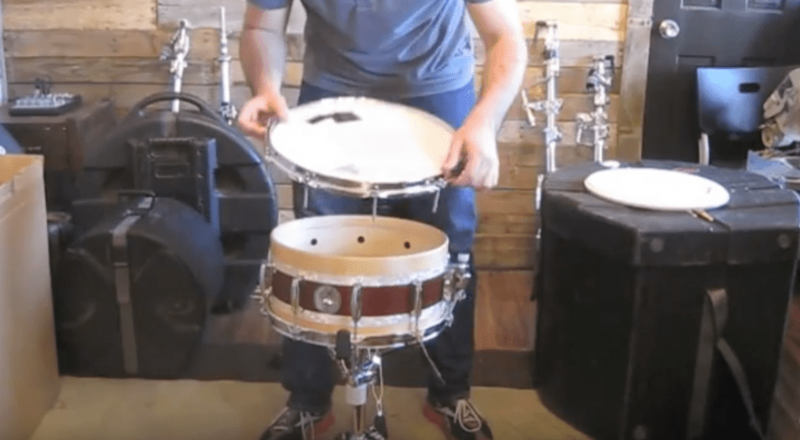 How do you tune your snare drum? What is the best how to video you’ve seen on drum tuning? Post it in the comments area! Hey what’s up this is Philip Ellis, and this is my method for changing and tuning a batter side snare drum head. Right now I have a Remo Controlled sound, and it’s perfectly fine, but for the purpose of this video I’m going to put on an Evans HD, and I’ve never used this in my life, so this is also kind of a demo for the Evans HD Snare Drum head. First, Take off the old head. I use a dry cotton cloth to wipe down and dump out any dust or debris that might be on the inside of the shell. You can also wipe the hoop to clean it, I sometimes use my shirt if it isn’t too dirty. Take your new drum head, put it on there, and finger tighten all of the tension rods. I’m actually going to set this down here on the ground so I can put some more elbow grease into it. What I do is I just press down on the rim and finger tighten it, and I do the star pattern. The star pattern if you don’t know is that you start at this lug, and go across from it. If it’s a 10 lug snare drum you can skip a lug and go to this one, but I don’t. Do this until you have tuned all of your lugs to relatively the same tension, and again this is finger tightening. Now I have all my lugs tuned up finger tight, NICE AND LOOSE! So what I’m going to do now is turn the snare wires off, and tap tune. I know that I’m going to be tuning up, so I tap about 1″ away from each lug and tune it up. Half the time I use my ear, and half the time I use my feel. I feel what the pressure is next to each of the tension rods. If I’m in the middle of a set and I can’t make noise and tap tune, then I’ll just use my hand and fingers to feel next to each lug, and see what the head pressure is like. I can tell which lugs are a little looser than the others. And that sounds really good, but I don’t have much experience with Evans Drum heads, but I know that the Remo drum heads need to be stretched a little bit. What I normally do is take the palm of my hand and put my full body weight into it and stretch the drum head. But I don’t think that the Evans drum heads really need to be stretched. The Reason I stretch my Remo drum heads is…if you don’t pre-stretch them, kinda like a guitar, if you don’t stretch them before you play them they will go out of tune when you start playing on them. So the idea is to get them stretched to where they won’t loose pitch when you start banging away on them. Let’s check this out again. I do this really fast because I like what I hear. I like that sound. Let me tighten up the snares…And that is a great sounding snare drum head! Like I told you from the beginning, I’m normally used to Remo Coated Ambassador drum heads, but I really love this snare drum head. For the bottom snare side head, there is really no science behind this. I picked up a tip from a Stanton Moore clinic, he basically cranks his bottom snare head, because that allows him to get as much sensitivity from his snare at any tuning, and volume. So I basically crack my bottom snare head pretty tight, and tune them all to the same pitch. Last Tip: Don’t use anything but a “snare side” drum head on the snare side. You want the paper thin drum heads for this, not a thick drum head. There are so many methods to tuning but it’s great to see you use something so simple and organic. I’ve never been too much of a perfectionist whilst tuning but there are three important points I’d like to add. 1. Tune heads on as many different drums as possible. Try testing on mates drums and a good idea is to use the same head each time. You can buy multiples from retailers with quantity discounts. Heads can be vastly different but if you can tune one you can tune most others – it’s just a matter of the relationship with the drum. 2. Make sure everything is in good order. Sometimes a warped hoop can completely throw off the tuning balance. And it might seem self explanatory but don’t try to use beaten up old heads! 3. Don’t be fooled by the notion that you MUST dampen a snare. Unless you specifically need a very dry, very dampened sound be sure to choose the right head for the drum and the sound required. The head Phil uses here has a very thin tone control ring built in to the underside but you can have an uncontrolled single ply head that has an open and wide tuning range and then use control like ‘moongel’ to find the right middle ground.